PLT will continue to maintain and grow Racket as it did for PLT Scheme for 15 years. Our commitment to this product hasn't changed and we will continue to work with all of our users on the usefulness of our programming language and IDE. This web page is maintained for historical reasons only. For all future releases, please visit the Racket site. 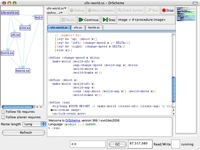 It supports the creation of new programming languages through a rich, expressive syntax system. Example languages include Typed Scheme, ACL2, FrTime, Lazy Scheme, and ProfessorJ (which is a pedagogical dialect of Java).